Knowing exactly how to get people interested in your business and coming up with ways to keep clientele interested in your service or product is also very vital for any upcoming, growing or already established business. For these reasons, there are platforms out there that specifically deal in generating leads for your company and building your clientele. Due to the digital era we currently live in, digital marketing has proven to be a very good platform for clientele generation. It is for these reasons that platforms such as Hoth and HopInTop were founded. These digital marketing companies ensure that your website has as much traffic as possible inorder to boost your sales and keep track of clientele as well as your investments. In this article, we shall focus on these two digital marketing companies in order to be well equipped when choosing a digital marketing company for your business. HopInTop, digital marketing company was set up in 2007 and has been operational since. Hoth on the other hand has been in operation since the year 2010. Both these companies are service digital marketing companies that aim to grow your business by ensuring that enough traffic is generated to your business's website in order to get maximum return for your company. Let us look at the services offered by each digital marketing company. Hoth is a service digital marketing company that deals with search engine optimization. This roughly translates into they are here to ensure that your business's website gets as much traffic generation as possible. Note that the only digital marketing product that Hoth employs to grow your business is SEO. The company offers amazing SEO products and services all in one. Through their specialized project management portal, one is able to access so many services like offsite links to your business's website, they provide you with well trained individuals that help in content creation so that your website has something for clients to look at among other amazing services. The digital marketing company also gives you access to top SEO tools that will definitely help you propel your business to the top. Such tool include: Rank tracker, Backlink, search competition etc.. All these measures the company has put in place is to ensure that your business gets to it's maximum potential. HopInTop digital marketing service also works to ensure that your business is at it's best. The difference between these two digital marketing companies is that HopInTop has over 50 digital marketing products you can use to go grow your business whilst Hoth only uses SEO. HopInTop has a variety of ways that they use to grow your business like PPC,B2B,Social media among so many others. They also offer to generate catchy quotes for your business that are sure to catch a guest's attention and immediately head over to your website. The company is also in partnership with very reputable companies like Google and Facebook. 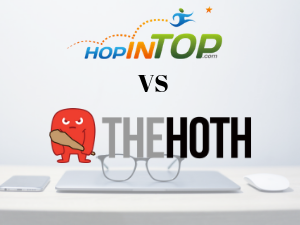 So while discussing what Is Hoth vs HopInTop it is quite evident to see that digital marketing is taking over the marketing industry and growing businesses all over the world. Get your business in line with others and join the world of digital marketing in order to get the highest possible returns from your investment without having to do the heavy stuff. Join a digital marketing platform today!